The Kansas City Zoo reported on Feb. 21, 2019 that Hamisi, a male 9-year-old male giraffe died on Feb. 20, 2019, after he sustained a spinal cord injury in a barn located at the zoo. Zoo officials report the giraffe caught his head in the area of a barn which zookeepers use to reach the animals. It is believed when Hamisi panicked, he thrashed about and damaged his spine. Zoo veterinarians performed a necropsy which determined the spinal cord injury likely killed Hamisi instantly. In 2016 the Giraffe was brought from Disney’s Animal Kingdom to the Kansas City Zoo. Last year, his two calves, Maxwell and Dixie were born. Senior zoo operations director, Sean Putney, reported the barn located in the giraffe habitat was built in 1995. For the past 24 years, there have been no other injuries in the barn. The zoo is conducting an internal review of the habitat to ensure an incident like this does not happen again. 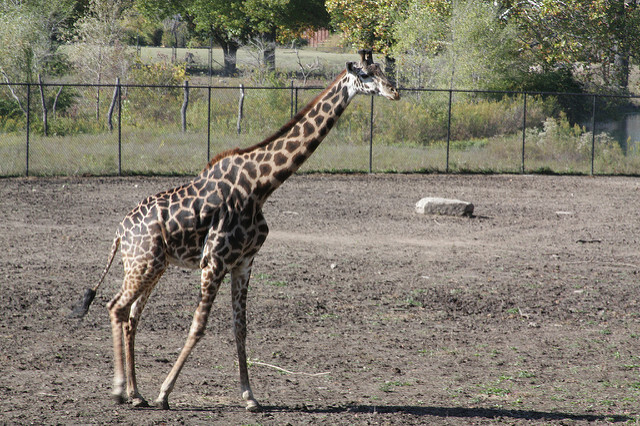 The remaining giraffes at the zoo reside in a separate area of the giraffe habitat. The configuration of that area is different from the one Hamisi lived in. Earlier in the week, zoo officials announced their polar bear Bam Bam was euthanized on Feb. 19. It was discovered she had liver cancer which was untreatable, and her health started to decline. One Response to "Giraffe Dies in Accident at Kansas City Zoo the Second to Die in a Week"